I love one pot meals. They are so easy. Throw it all in and let the oven deal with it. Seeing as today is so grey and miserable – I’m loving it, though! 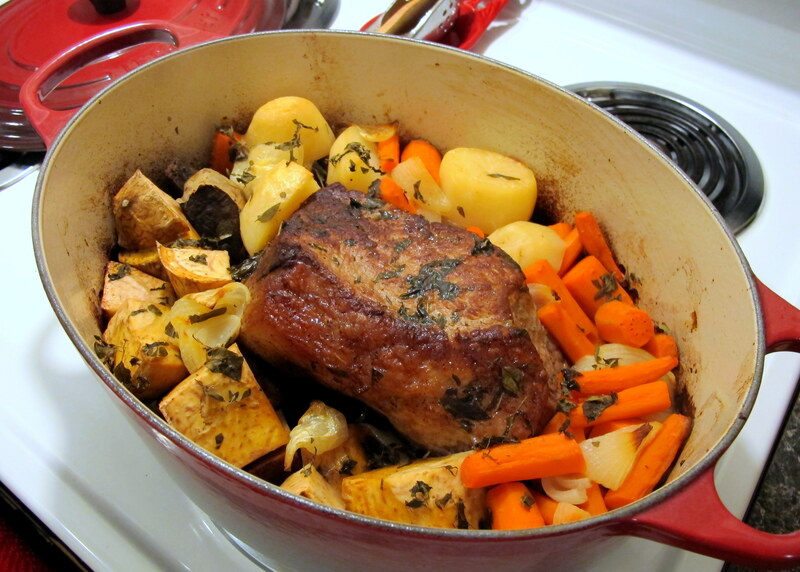 – I thought I’d jot down how I do my pot roasts. This one was made months ago when we had visitors from home staying with us. Ev and the guys had driven up to Vancouver, BC for a night and were coming back Sunday evening. I had been told that, due to this blog, expectations were high with regards to cooking so I wanted to have a nice meal ready for them when they got home. I know, aren’t I a nice wifey? Well, my dessert-aholic side got the better of me and I wanted to spend more time on that than the actual dinner, so a pot roast it was! I used to be scared of pot roasts. The first time Ev and I tried to slow cook beef was back in 2006 and it ended up with us out in the back yard, scraping the burnt remains from the bottom of Mum’s biggest saucepan. Guess who forgot to top up the water as we went? One or both of us. I think Mum might have been away with my little sister at one of her cycling races, so Dad was the only one who knew… Mum, if you’re reading this – sorry! But the pot is fine, you’ve been none-the-wiser for seven years now! But they aren’t as scary as all that. And cooking in a dutch oven makes life so much easier. I promise, just give a pot roast a go on a cold day and you will thank yourself for trying. Roasts are hearty, filling and nutritious (when you include all the veggies). 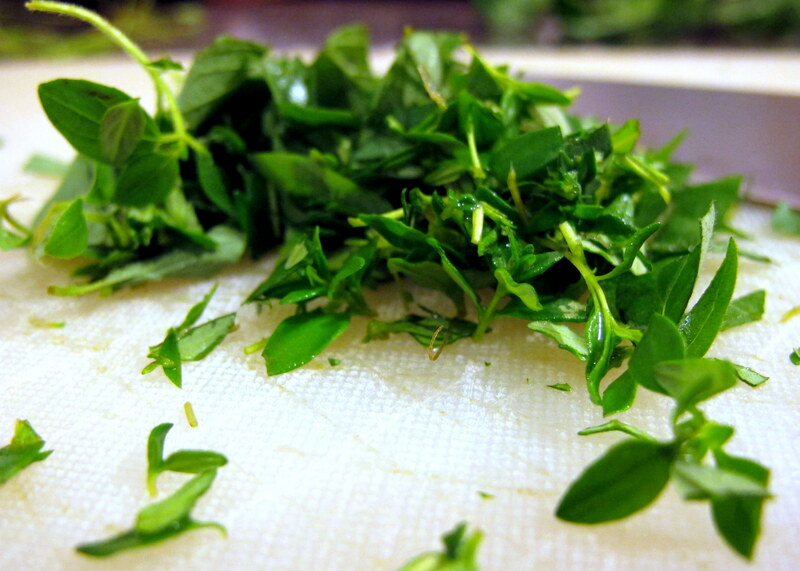 Fresh herbs are generally very well tolerated among the FODMAP community. The dried varieties can be mixed with unsafe items such as onion powder, so if you opt to use dried herbs, make sure you know exactly what’s in them. 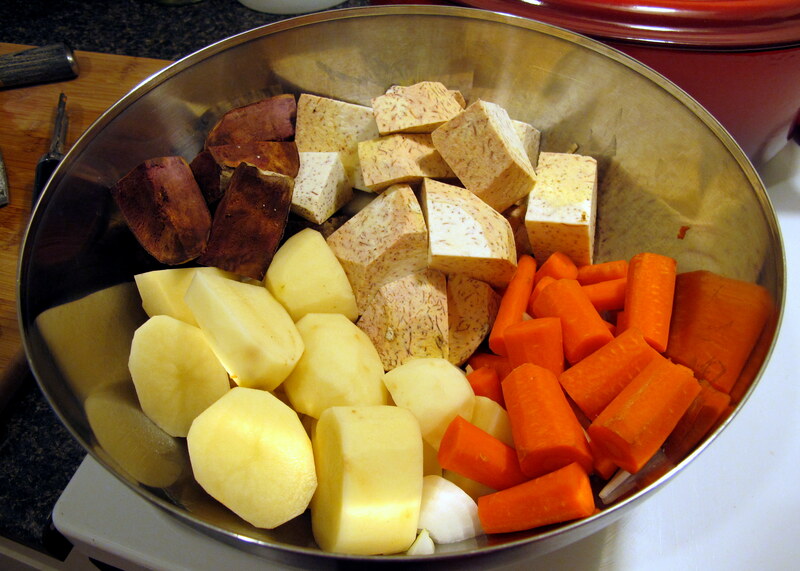 Roasting veggies are also generally well tolerated by those with FM but in high enough quantities some, such as sweet potatoes, might elicit a reaction due to the increased serving of polyols. You can choose which veggies suit your own diet/tolerance levels. Easy! FODMAPs are water soluble, so the fructans in the onion and garlic will leech out into the fluid in the bottom of the pot if they are left in while cooking. To what extent this happens is determined by the size of the onion chunks (smaller pieces mean there’s a bigger surface area for water to contact the onion and fructans to seep out), the amount of water-based fluid in the bottom of the pot and the length of the cooking time. For some it may be okay to cut the onions into large chunks and pick them out serving but for others it may not – especially if you are on elimination. In that case, please leave it out altogether or infuse the oil with the onion and garlic just after you seal the pan at the start. Served 3 very hungry blokes and myself. Would serve 6 normal appetites. Firstly, roughly chop all your veggies into half-fist sized chunks – we had some really interesting yams going on here, as one of the guys shopped up a storm at Uwajimaya. Prepare the herbs (pick the leaves off and dice finely) and put them aside. Seal your pan with olive oil and then fry onion and garlic in oil for 2-3 minutes, until fragrant. This infuses the flavours into the oil. Now remove them before they begin to leech fluids. 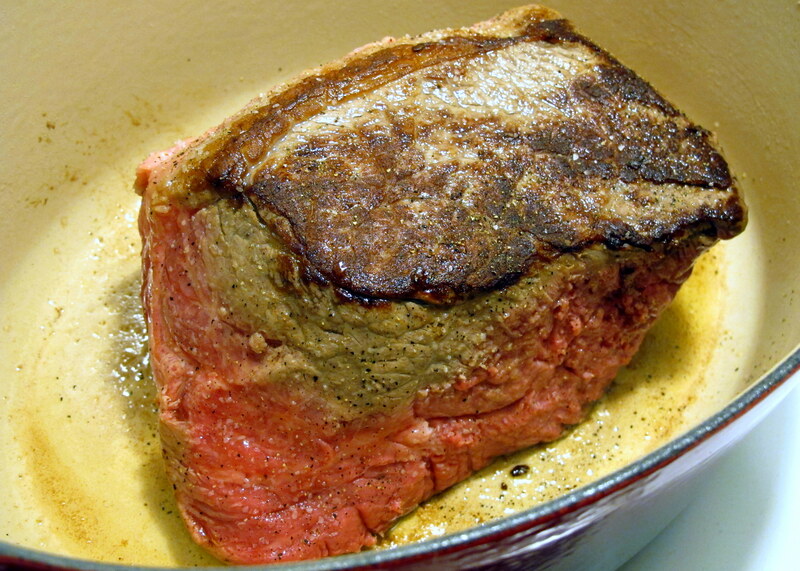 Next, sear each side of the chuck roast – perhaps 2 minutes a side; season with salt and pepper as you go. You want the meat to be cooked about 2.5 cm/1 inch in from each edge. Meanwhile, combine the broth, red wine and GF soy sauce in a bowl and have it ready for the next step. 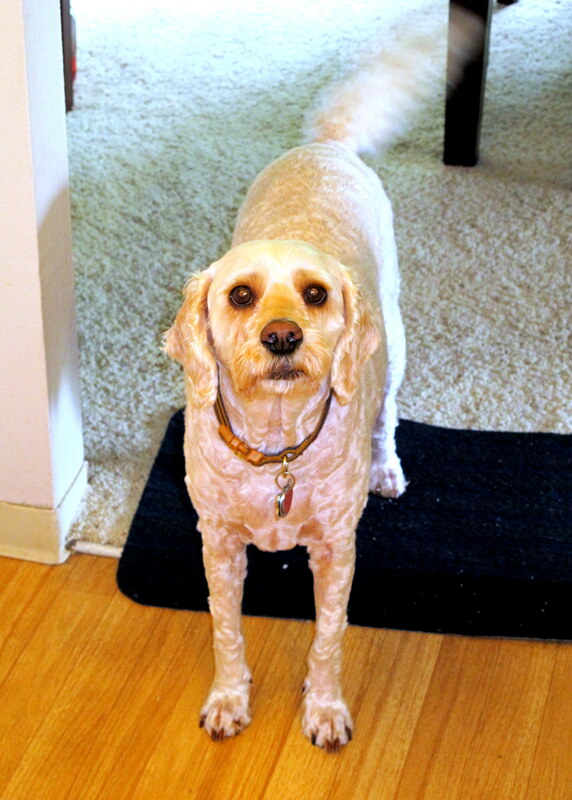 Banish four-legged family members from the kitchen, because they’re getting in the way and really annoying with all that crying. Remove the beef from the pot and set it aside. 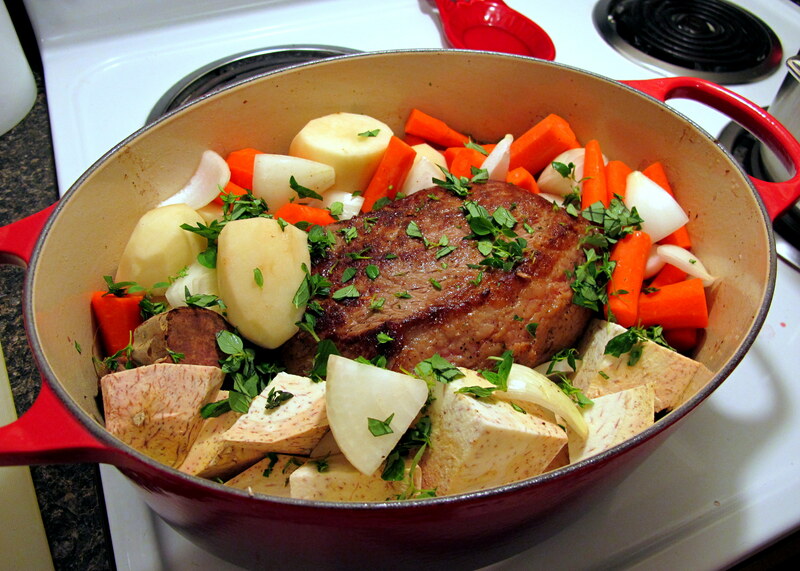 Pour in the beef stock/wine mix and the asafoetida (optional) and deglaze the base of the Dutch oven. It should only take a minute or two, stirring well. Return the beef to the pot and put on the lid. The general rule with beef roasts is to cook for 30 minutes per pound at 180 C/350 F. If you want it pink in the middle, cook it a little less. Therefore, cook it at 180 C for 1 hour and 30 minutes. Every 30 minutes, remove the lid and brush the top with its cooking juices. With 60 minutes left, add in the roasting vegetables. In the photos below (which I will update asap), the veggies were in from the beginning and were a little over-done. After 1 and a half hours, it should be cooked! Remove the roast and slice it into 2 cm thick slices (or whatever you’d like). Arrange it on a serving dish and surround it with the roasted veggies. If your serving dish is oven safe, put it back in the oven, which should be off but still cooling, to keep it warm while you make the red wine reduction. Skim any fat off the top of the liquids that remain and discard. Top up with some more red wine if necessary and pour in the corn starch/water mixture. Bring it to the boil and then reduce to a simmer for 5 minutes or so, until it thickens. 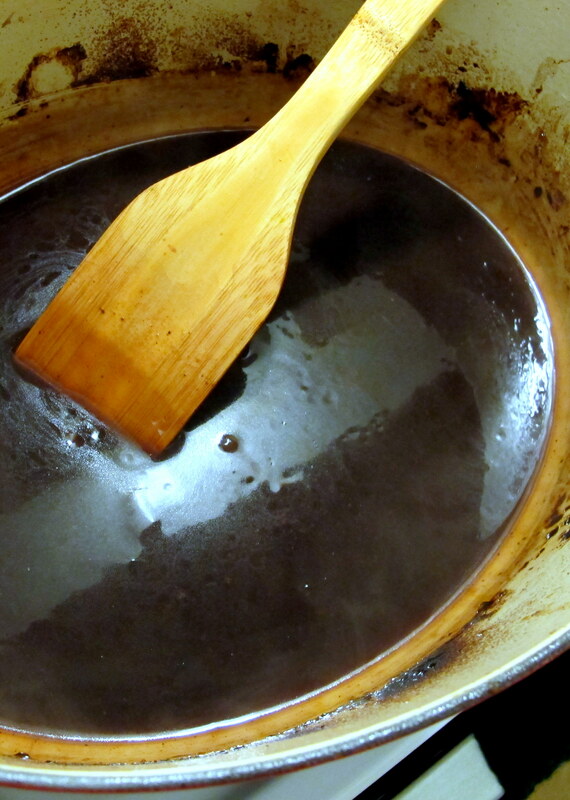 Serve the red wine reduction in a gravy boat or a deep bowl with a ladle. Unfortunately, I didn’t take a nicer photo of the platter on the table because nobody waited for me. They were starving, I suppose. 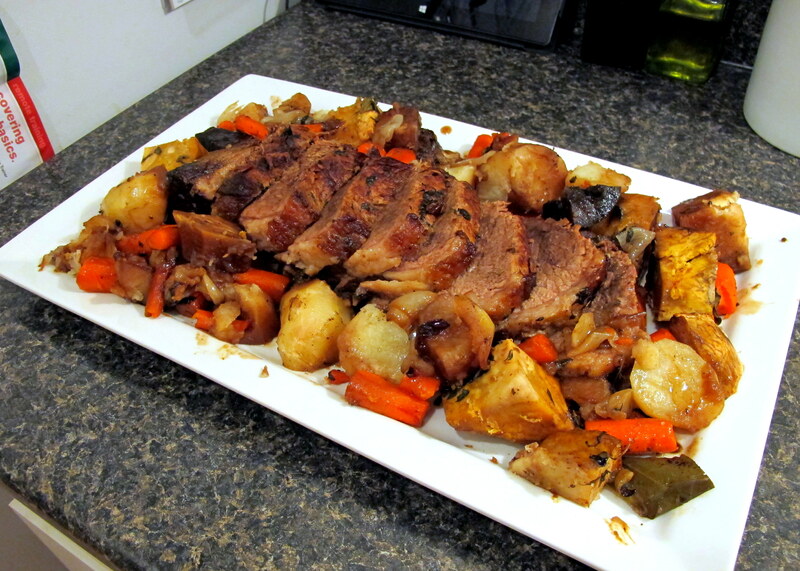 Roasts aren’t the prettiest of dishes but they more than make up for it in taste and warmth. This entry was posted in Carnivore, Dinner / Mains, Sauces & Dips and tagged Aussie, Australia, beef, beef roast, braise, braised beef, cockapoo, dessert, dinner, Dog, Dutch oven, easy dinner, FODMAPS, food, fructose friendly, fructose malabsorption, gluten free, healthy, home-cooked, homemade, low fructose, low sugar, one pot meal, pot roast, roast, Seattle, spoodle. Bookmark the permalink. It looks good and as I’ve just put it in the oven for dinner tonight, I hope it is good! One thing though: you didn’t mention what to do with the herbs and bay leaves after chopping the herbs. I sprinkled them over the top of the meat and veggies just before putting them into the oven to cook, so I’m hoping that works out okay! Didn’t I? Whoops, sorry. Yes, you can do that or you can also infuse the flavours into the oil before you sear the meat. I hope you liked it! It was really good, thank you! 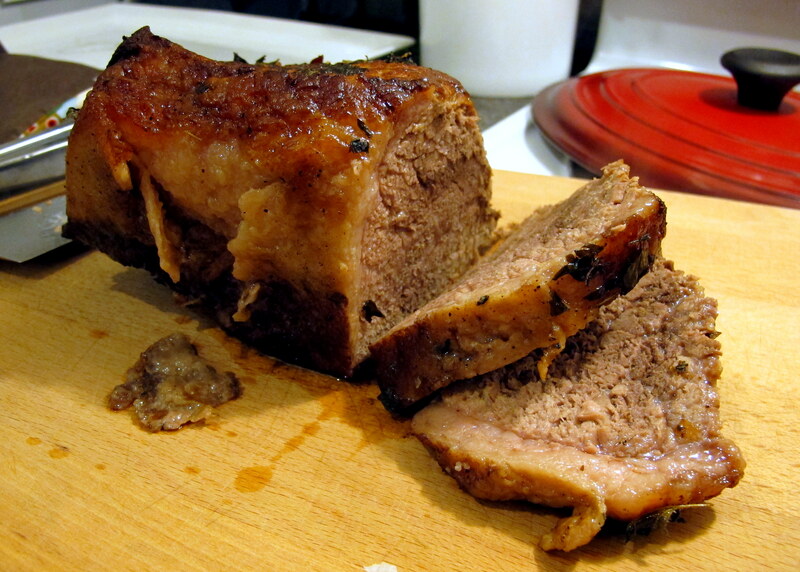 A little dry, but I used a topside roast which had no fat at all, so that may have had something to do with that. But the gravy/red wine reduction was delicious! Everybody came back for seconds of rice (which I served with it) and gravy! Yeah fat content is important, unfortunately. 😛 But I’m glad you liked it otherwise! Wow! Mouth watering! I am infusing the oil now with onion…I bought garlic infused olive oil…so hoping it works out well. Thanks so much for the recipe! My doctor put me on the Fodmap diet a few days ago…so this is very helpful. Looks amazing!